When you look at this 1955 Chevrolet Bel Air, you could be forgiven for thinking that it is an older restoration. Nothing could be further from the truth. 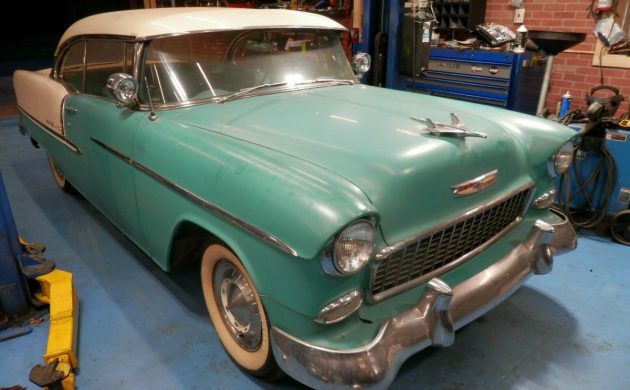 This Bel Air is completely original and unmolested, and its condition is pretty special. The 75-year-old owner has decided to sell his toys, and the Bel Air is chief among them. 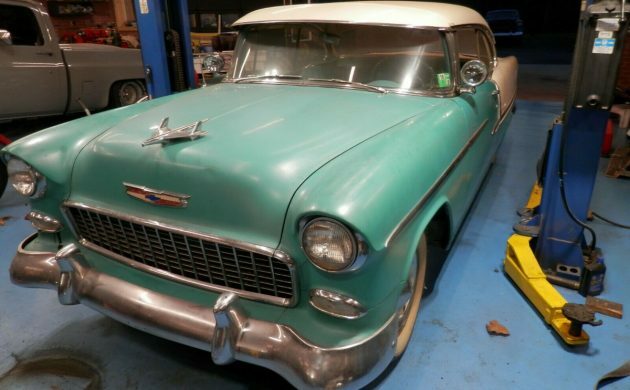 Located in Siloam Springs, Arkansas, you will find the Bel Air listed for sale here on eBay. The owner has set the BIN price at $65,000 but is willing to field offers. Take a long, hard look, and see if you can spot any rust. The owner assures us that you won’t because it took him years of searching to find this particular example. The owner fell in love with the ’55 Bel Air when he was young, and always wanted a good one. He owned a hot rod shop for over 50-years, so knew exactly what he was looking for. He says that you won’t find so much as a pin-hole in this car anywhere, including the floors. The paint is looking a bit tired in a few spots, but it would be interesting to see how a good polish would bring it up. The owner does note that the driver’s door has undergone a repaint at some point in the car’s life. If you want an indication of how original and well preserved this car is, then consider that the original rubber mat is still in the trunk. It is now getting a bit dry and crispy, but the original spare tire is said to be fine. If I owned this Bel Air, apart from cleaning a few dirty spots off the upholstery, I probably wouldn’t touch anything inside the car. The headliner is perfect, and apart from those few dirty marks and some wear on the wheel, there’s not much to fault inside the car. The rear seat still has its original factory clear plastic cover on it, which is not something that you see every day. They are only original once, and I would be doing my best to keep it that way. Things are just as rosy under the hood of the Bel Air. The original 265ci V8 is under there, and as it came from the factory with the optional Power Pack, it produces 180hp. This is then fed to the rear wheels via the original Powerglide transmission. The owner states that the car hasn’t been driven for the last 7-years, so it will need the fuel system flushed before it is started. 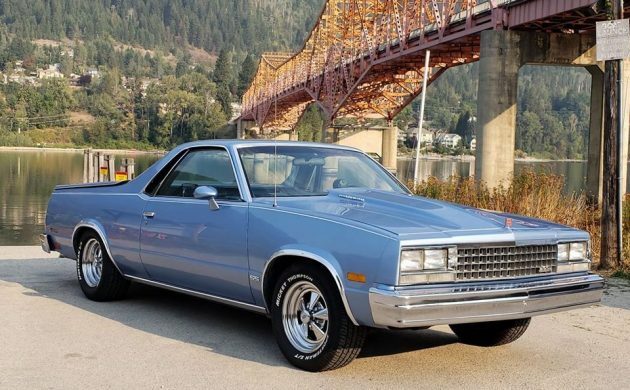 The astounding level of originality continues here as well, as the Bel Air still wears its original, 64-year-old exhaust system. That fact alone is enough to have me shaking my head. This isn’t unheard of, but it sure isn’t common either. To refer to this 1955 Bel Air as a “time capsule” is unfair, because I honestly think that it is something more than that. To me, a time capsule is a car that looks like it has just rolled off the showroom floor. This Bel Air is an amazing survivor. You can see that it has lived, that has been used, but it has also been loved and cared for. That makes it better than a time capsule, and it makes it a car that would be well worth owning. 1956 is my favorite of the 55,56,57 years but I have to say that this is quite the jewel. In there day A solid reliable car that met the needs of the time. As described this is a unique car and has value, I’d say more like $45k. In the end it will be worth whatever someone is willing to pay for it. As for the back seat I never could understand why you’d leave that plastic on there, that would be terrible to sit on on a hot day. It’s the least used seat and if this was my car it would be uncovered as soon as it got home. Neat car but I think 65k is I don’t want to sell it price. Seller must have promised the wife he would sell something. My brother has a friend in south Texas with a ’55 similar to this sitting in his shop. It is solid white, 2 dr sedan with a 265 power pack and a three speed on the column and around 30k miles on it. The original paint would clean up well with a compounding and wax. Unfortunately he just bought stuff, but never did anything with it. Fortunately it is sitting inside. He has about half a dozen el caminos and chevy pickups sitting outside deteriorating. My father tried to buy it from him shortly before he passed away in November of last year. (His first new car was a 56 Bel Air 2 dr. sedan.) After dad’s house sells later this year (hopefully) I plan to go back and try to get negotiations restarted. 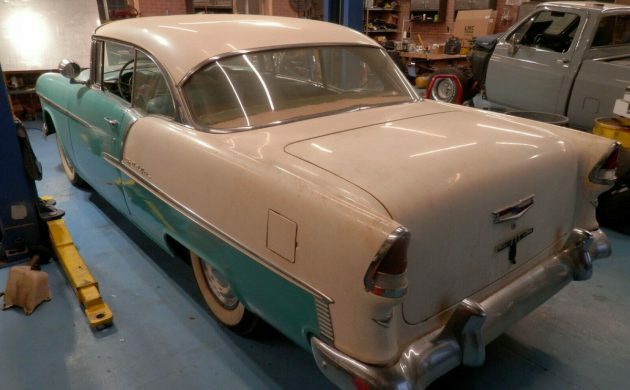 This `55 has to be among THE last bone stock survivors still around (of any bodystyle) that hasn’t been restored, molested, tubbed, pro-stocked, or customized. I shudder to think what some buyer will do to it..Look close at this one guys. A cold beer says it won’t stay this virgin for long once it’s sold. Not at this price. It’s to expensive to be the foundation for a modified build. Geez, the guy’s 75, cut him some slack. Maybe he has some medical issues or perhaps lacks the energy to get out there and detail the car. Hopefully if someone buys the car they will value the originality of it and not rod it out. Right on. Thank GOD the old boy kept the car this nice. I am 71 and have a 55 Chevy in my garage. I do have a pickup truck project I’m working on but if my I was going to sell my 55 and it needed to be cleaned up I would take it somewhere. Like to restore them but clean and polish not so much. I’m 77 last Saturday and crawling around under a car or doing a major detail ain’t in the cards any more. 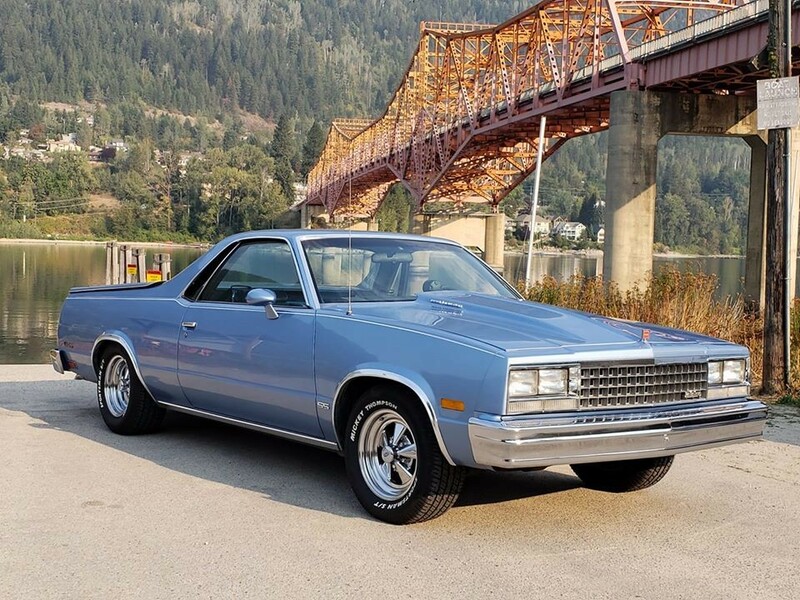 My cars were all ultra clean and detailed (5 licenced special vehicles including a 35000 mile (documented) all original one owner 57 Pontiac Wagon. a 57 Pontiac Laurentian 2 dr HT I had owned for 40 yrs, a 75 Olds Cutlass. 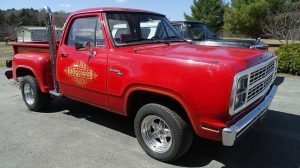 a 77 Chevy Stepside 454 T400 customized go fast truck a 56 Pontiac Laurentian Convert. restored original. And it was always clean inside and under the hood. Luckily my 82 GMC Caballero is clean and detailed the way I bought it so it’s not a chore. 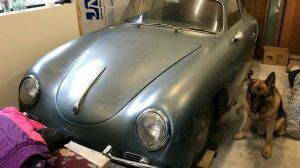 So – – – getting a bit older has its limitations – – -but doesn’t in any way curb my enthusiasm for the automobile restoration and collector hobby. Don’t remember seeing many classics or special interest vehicles, boats, motorcycles I didn’t like. even some of the garish creations out there – – – appreciate everybody’s efforts. Nuff sais – – -for now. Looks like a lot of “old guys” are still gear heads. I’m 76 (been fighting cancer for 6 years) and I still have a Vette and still do routine maintenance of all 4 of my vehicles. Point is, a lot of us are getting older but haven’t lost our zest for old cars. Diane, the owner is getting older and may not be able to clean it up for the sale. His eye sight may be off and can’t see anything wrong. He definately has not kept up with today’s market. But bottom line, maybe it really isn’t for sale. I love the 55 and 56 the best just because the way the front bumper was verses the 57! I would love to own one and customize it to my liking to make it a pro touring type car!! The car is so popular that the prices are always ridiculously high!! Survivor cars are cool but face it your not going from Texas to New York in it! I wish everyone didn’t feel like there car was the last gold mine in the world!! Actually you can modify these cars to run and drive a lot better without any cutting, drilling or welding. It just takes time and engineering. The resto-mod chassis and late model motor runs better than mine, but I can return mine to stock by turning wrenches. Over the 41 years I’ve owned it I have put a 1969 DZ block 302 in it, modified TH 350, 605 power steering and power disc brakes. I have all the original parts on the shelf that can be put back in with wrenches. I bought an original 283 1957 Power Pack motor that’s a runner and on an engine stand in case somebody in the family ever wants to do it. The Craig PowerPlay high power 8 track tape i bought in 1979 still works great. It’s bolted to the dash under the glove box because I wouldn’t drill holes in the bottom of the dash lip and that’s where the holes are, probably for a tissue dispenser. The CB radio antenna mount is still on the back bumper in case the 55 MPH speed limit comes back and I need to make a 1000 mile road trip in it. Tim, people used to drive these cars across country regularly. But that was a different generation. My Dad bought the 57 Bel Air from my Cousin in LA and drove it through Texas and Florida to get back to Pennsylvania in the spring of 1978. I admit that he was a mechanic, trained by everybody from the US Army to Chevrolet, and not 100% sane on a good day. I drove it from PA to Richmond VA in 1981 because the Quadra-Junk carburetor on my truck screwed up. You wouldn’t want to try that today, if you need parts the kid at the Auto Zone counter doesn’t know what to do if you need points for a 1960’s vintage car. The last 1000 mile round trip I took with one of my cars was 1985. 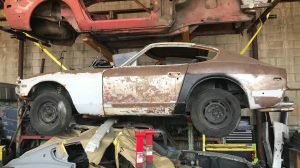 1969 Z-28 Camaro, low miles, 4:11 gears, and we got stupid after a few cold ones but didn’t end up in jail. After that the cars showed up at class reunions on a trailer behind a Suburban. We chained the car to the trailer and gave the keys to my friends wife with instructions to not give us the keys until tomorrow no matter what we say. It wasn’t that the car wouldn’t make it, we might be famous for stuff we did in 1985. There’s still a couple of places I might have trouble with if they knew who I was in those days. I had a good friend in high school in Los Angeles who had a 1955 Bel Air he inherited from his grandfather. The car was like new with 65,000 miles. The car was all original canary yellow with a turquoise interior. It still had the plastic seat covers. Only drawback was it was a straight 6 Cylinder engine with an automatic. It drove great and was always garaged. He sold it after graduation for $500 as he was heading to college. That was back in 1972. If he knew someone would ask $65,000 47 years later for one, he may have held on to it. He got top dollar in 1972. This car is exceptional ,no doubt. 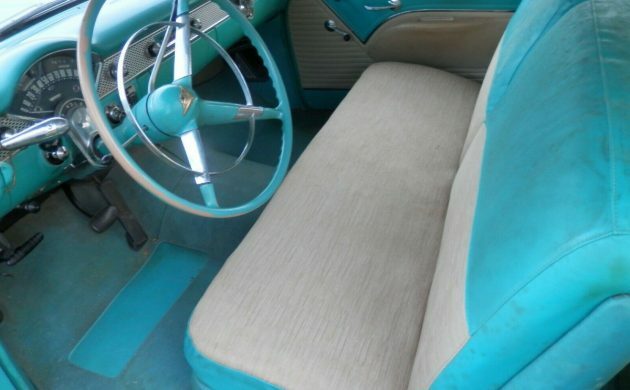 I had basiclly the same car in high school, in1961. I agree with most, just clean it up and enjoy it, but it will take the right person to part with 65K. Also, for what its worth (you can do the math). Age has nothing to do with it. How old would you be, if you didn’t know how old you are? It’s nice and original, but not a museum piece. 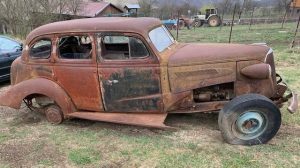 It would be a great car for someone that wants to preserve an original as built car. I would not recommend driving it much as those 1955 265 cid engines did not have oil filter on the block, and it was not ordered with the optional A/C remote oil filter cartridge system. Most likely the rods and main bearings are pretty scuffed and and lifters and cam are worn. Those early 265s rarely lasted more than 50-60k miles. I had a few, and they were all shot by then. But I love the 55, don’t want to comment on the asking price. He will most likely get it and the buyer will feel better than the seller. Since when are hardtops worth more money than convertibles?? I just went to Barrett Jackson over the weekend and saw a convertible 56 Belair in excellent condition completely restored sell for 35K. This car is worth about 17k tops. I was involved in a multitude of arbitrations over expected values and worked for lawyers on occasion. as well as attending courts as an Expert Witness. B-J auctions are great to watch and the values are often misleading as the fat cats get embroiled in bidding wars just because. 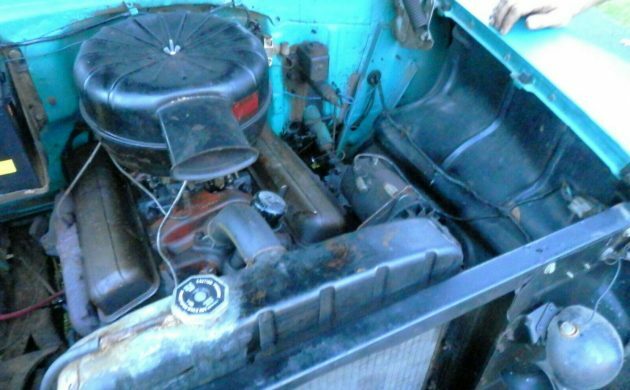 Anyway the mentioned 56 Chevy Convert at 35K is surprising to say the least. Probably the serious bidders had a good preview of the vehicle before it went across the block or maybe the first day of the auction? We have a club member who has an all metal fully restored 56 Convert and if he was offered 35K the person offering would probably get a wake up slap up the side of the face. Bottom no matter the condition 65K ???? Good luck on that one.